For Outside U.S. subscribers only. This is also my billing address. Security Code Where can I find this? Innovision may contact me regarding special promotions and events. 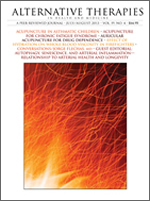 Alternative Therapies in Health and Medicine is published six times a year. Subscribers: If the post office alerts us that your magazine is undeliverable, we have no further obligation unless we receive a corrected address within two years. Credit/debit cards are subject to card approval. For further assistance contact customer service at 877-904-7951 (US and Canada) or 651-251-9684 (International).